Complete quests to find skin blueprints in your loot. Each skin has a unique blueprint. 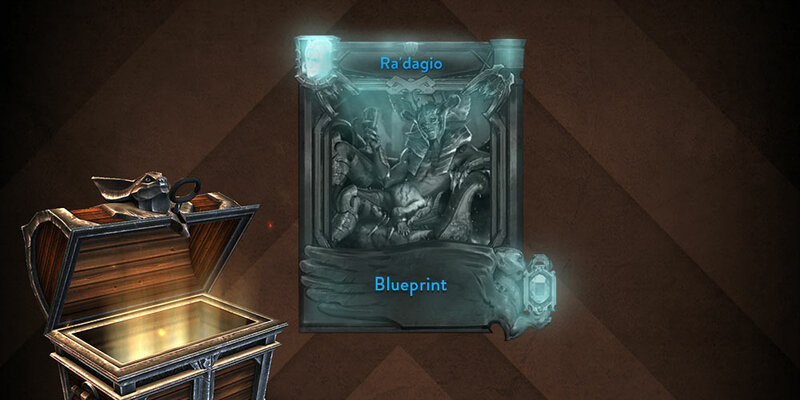 Unlock the skin by spending your single blueprint and the required Essence. New and longtime players have consistently told us that the tiered, card-based skins system is too muddled, difficult to navigate and requires painfully repetitive behavior, like individually destroying hundreds of cards for Essence. In addition, the card system bogged down loot drops with undesirable commons and created UI clutter. The revamp unifies two largely disconnected systems, clearing up all the related confusion. THE HUNT FOR BLUEPRINTS BEGINS! In the new system, players can focus their attention on finding blueprints (one for each skin). Once the blueprint is discovered, all that’s needed is the Essence to finish crafting the skin. Essence is the same for all skins, so this common pool can be easily distributed however you want. And instead of scanning through a skin collection looking at “79/8” cards (lel) and doing a ton of mental math, you’ll know exactly where you stand at all times. 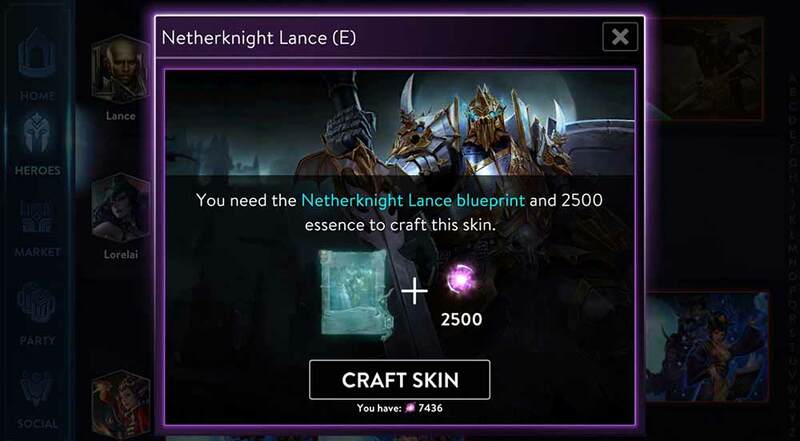 If you find a skin blueprint you already have, it will automatically convert into a bunch of Essence you can use toward crafting any skin. If you find a blueprint for a skin you’re not interested in, you can always destroy that blueprint for Essence to put toward a different skin. To discover new blueprints, complete in-game quests. Every time you complete a quest, a blueprint might drop as chest loot. In Update 2.12, in-game quests are the primary way to acquire blueprints, but we’re looking to introduce more ways to get blueprints over time, whether that’s rewards systems or special offers or something entirely new. Do you have a skin in progress but won’t have time to finish it? We didn’t forget about you. All existing cards in your library will be automatically destroyed for Essence at their full crafting value. 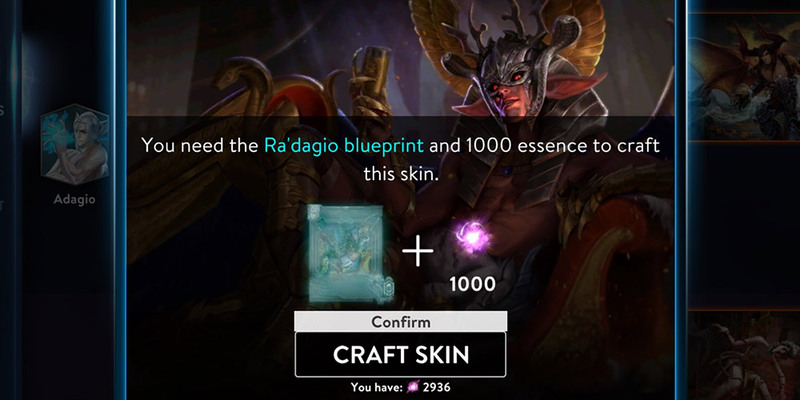 You will only be granted blueprints for skins currently craftable, but you will get Essence for all of the cards you had. For any cards for uncraftable skins and for Limited Edition and Special Edition skins, cards will be destroyed at the highest Essence value. 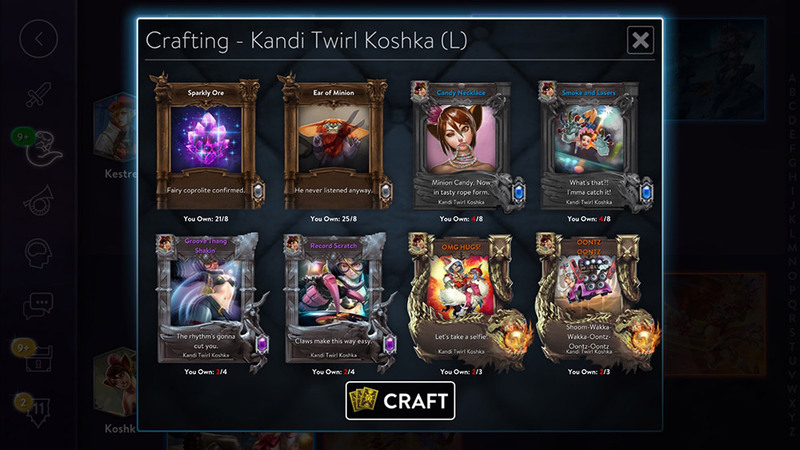 YumaRanken is hoping that in Update 2.12, she’ll get the Kandi Twirl Koshka (Legendary) blueprint. To get the “grandfathered” blueprint automatically, she needs cards worth at least 33% of the Essence required to craft the skin, which is 1,188 Essence. That’s more than enough to get the Blueprint automatically! If you want to check which blueprints you got when Update 2.12 hits, just head to your SKINS browser. 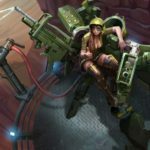 If you’re interested in all the nitty-gritty numbers for the new skins system, keep an eye out for a more complete chart/breakdown being published by AdyEndrus separately prior to Update 2.12’s release. Wait … Did you just say you’re automatically destroying my card collection?! That’s correct. We’re removing all the cards from the game, and in doing so freeing up a ton of clutter and memory usage. But we recognize there are a lot of players who enjoyed collecting cards and admiring the card art. That’s why we are retaining the data of each player’s individual card collection. We intend for your personal card art library to return sometime in the future in a new, different form. It’s likely some ways away and it’s premature to talk about that right now, but we know how many of you feel and we’re all over this. Eliminating the three-tiered skins system necessitated breaking apart our existing tiered skins such as Catherine’s “Paragon” skin line. 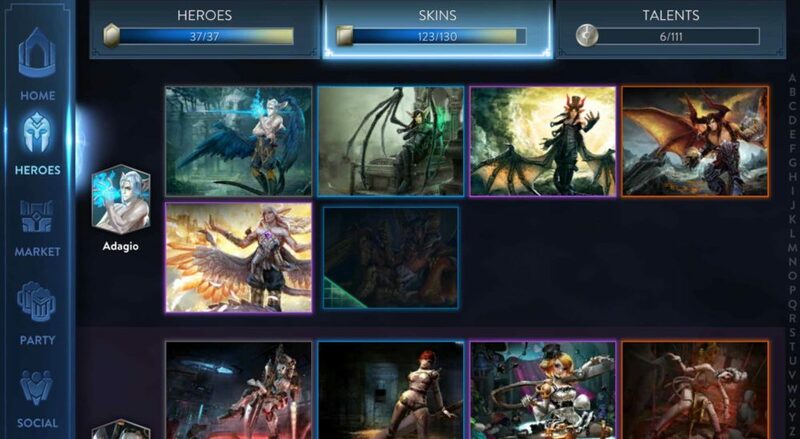 Now, instead of three different skins all named “Paragon Catherine” of different rarities, you’ll find “Queen’s Knight” Catherine, “Paragon” Catherine and “Serpent Mask” Catherine all individually listed in-game. While the tiers are gone, we’ve introduced new skin “themes” across heroes for you to collect, including an “Ice” theme (Glaive, Krul, Reim, Skaarf), a “Churn” theme (Phinn & Rona) and two additions to the “School Days” theme (Joule & Samuel, joining Taka, Lyra, Vox & Koshka). These themes are just to collect for fun; there’s no relationship you have to worry about for skin crafting. We’ll also take advantage of these skin themes to create sale bundles and special boxes. While the new system is cleaner and simpler, it also means targeting a specific skin to craft will be harder because of the randomness of blueprint loot. You can’t control which blueprint will drop, so if you have your heart set on a particular skin, you may want to more often purchase it with ICE. Because of this, we’re reducing prices for the vast majority of skins, so your premium purchases will go much further. Actual prices vary depending on the skin. This is an especially good option if you don’t want to take the time to craft a skin or must have one skin in particular. The contents of Rare and Epic Mystery Chests may also change over time as our systems evolve. Special Edition skins will not have blueprints in Update 2.12, although it’s possible this will change in the future. For now, the primary way to get Special Edition skins remains collecting and spending Opals and participating in special boxes and bundles. If you’re a Vainglory OG who has the original seven limited-edition skins, those are still sacred and will not be craftable. If you don’t have them already, there’s no way to get them. If you’re a Golden Tickeholder, you’ll be receiving the Limited Edition Golden Netherknight Lance skin in Update 2.12 as a gift. That LE skin is also not craftable in the new system. We’re confident this new skins-crafting system will be a better experience for new and dedicated players alike. Give it a try, and after you’ve used it enough to form an opinion, tell us what you think. With your help, we’ll refine and improve the system over time. NEW FREE HERO ROTATION: CATHERINE, KRUL & MORE!